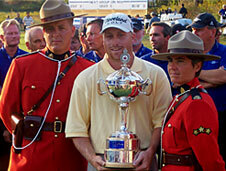 The Canadian Open has been a strong fall classic since 1904 and this year's tournament made a bit of history. 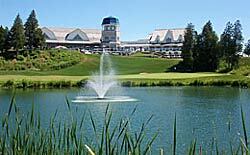 Since 1977 the event has been shuffled between two courses: The Royal Montreal Golf Club in Montreal (where this event began in 1904) and Glen Abbey Golf Club in Oakville, Ontario. This year the Royal Canadian Golf Association and the PGA made a decision to open the event to other courses and the first course to receive the honor was Angus Glen Golf Club in Markham, Ontario. Angus Glen was a wonderful choice - from perfectly groomed greens and tees, immaculate fairways, and a championship layout to the excellent practice facility and beautiful clubhouse, the property suited the needs of the Bell Canadian Open to a tee. The success of this year's event, though, rested on the shoulders of the fine folks of the RCGA and was assured by the tenacity and dedication of Angus Glen club manager, Kevin Thistle. His abundant energy and great people skills ensured that this year's event would be a memorable one. And, although the RCGA and the PGA work together on the technical part of this event, it is the volunteers that make sure that everything goes as smoothly as possible. 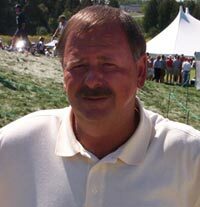 The Bell Canadian Open has hosted great champions in the past: Tiger Woods, Greg Norman, Nick Price, Billy Andrade, Lee Trevino and Mark O'Meara just to name a few. 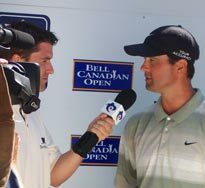 But this year's event was very special for Canadian golfers as eight Canadians participated in the event - Mike Weir and this year's Tucson National Open winner Ian Leggat being the most well known of the bunch. Richard Zokol, Dave Barr, Glen Hnatiuk, David Morland IV, Todd Doohan, and Derek Gillespie joined Mike and Ian to represent Canada. A big surprise this year was the lackluster play by last year's winner Scott Verplank who failed to make the cut and was unable to defend his championship. Other great players like Hal Sutton and Mark O'Meara also did not make the cut. 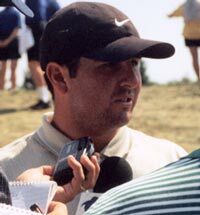 Pat Perez scored the Angus Glen course record of 63 on his final round. This year's Open was played in perfect weather with sunshine for all four rounds. Spectators were looking forward to some low scores and broken records. Some players thought that the course would be too easy - but then failed to make the cut (Angus Glen is a magnificent but fair challenge that demands concentration and skill. Grant Waite of New Zealand posted a (-8) on his first round for the outright lead for the day. Four players tied for second with a score of (-6) Per-Ulrik Johansson, Billy Andrade, Neal Lancaster, and Greg Chalmers. 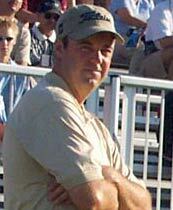 With Waites round of 64, he set a new record for Angus Glen. We followed Mike Weir (-3), Carlos Franco (-5) and Matt Gogel (+1). Weir went two under for the day, he had a great start and on the seventh green he sank a 30-foot putt for eagle to put him seven under. It looked like this was where Mike was going to break away, but not so. 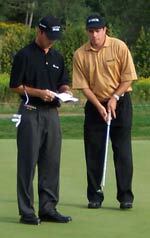 The bogies started to come as, even though he put himself in birdie position, Weir struggled with his putter. 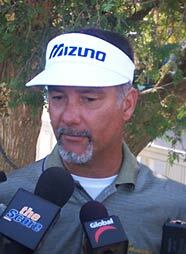 Franco had a very steady day to post a four under score and tied for third place with Corey Pavin at (-9) who shot 66 that day. Matt Gogel had a solid day and shot a 68 to get back in contention. 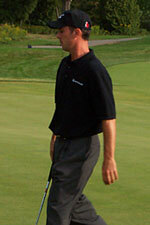 Greg Chalmers shot a 65 and found himself in second place at (-14) two strokes behind Neal Lancaster(-16) . Vijay Singh shot a 66 to go thirteen under and tied with four other players in third place. 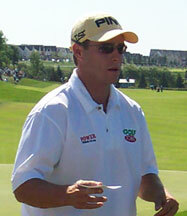 He joined Steve Flesch who also had a great round of 65 to get himself in the game. 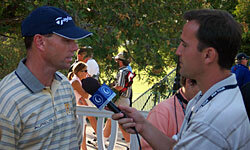 Justin Leonard and Grant Waite and Billy Andrade. Carlos Franco and Corey Pavin both shot a 76 and they put themselves out this tournament leaving them 11 strokes off the lead. Gene Sauers went to ten under to give himself a chance. Sauers just come off a win at the Air Canada Championship in Surrey B.C. Leggatt pars the course which puts him up for a long climb while John Daly is just having fun and is sitting at (-6). 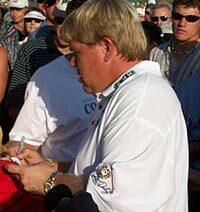 Canadian fans just love John Daly - you never know what to expect from him and he is a very amicable person. John Rollins is making a move and scores a 66 to get him within 7 strokes. They say a tournament round is 72 holes and on the final hole you feel the most pressure. What would you rather have - a two stroke lead or be two strokes behind? The pressure is the same. Ask Neal Lancaster. Coming home, Lancaster was two strokes up after Justin Leonard bogeyed his last hole finishing at (-16) and John Rollins shot 7 under par for the round also finishing at (-16). It was looking like sure win for Lancaster. His good tee shot found him looking at the green, with water on the right and bunkers and rough on the left. The safe shot was in front but he felt comfortable taking the riskier shot and going for the pin. He failed in his attempt and ended up in the rough where he executed a poorly placed chip that landed his ball approx. 40 ft. away from the pin. He missed his par putt and had a bogie putt left which would still win it all for him. But that putt attempt also failed - leaving him with a double bogie on 18, a final score of (-16), and a tie for first place with Leonard and Rollins. So an hour after Rollins had posted his final score, he was called out for a playoff hole. The group met at the tee box on #18 and each landed nicely on the fairway. Lancaster's approach shot found the sand, Leonard's approach landed on the left side of the green leaving him a 40 feet putt for birdie, and John Rollins knocked it on the green approximately 20 feet left of the pin. Lancaster's poor sand shot left him with a long par putt and he ended up with a bogey while Leonard missed his birdie putt by very little and finished with a par. John Rollins spectacular 20 foot birdie put finds the cup for a surprising and exciting end to the Bell Canadian Open and his first PGA Tour victory. 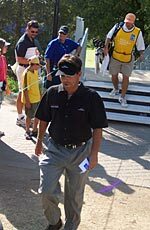 Although this is not the first upset in PGA history, it was certainly a very humbling experience for Neil Lancaster (who played a great game throughout the tournament) and an educational experience for us all. 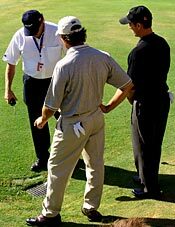 Our shots and putts are fickle friends…they're not always there when we need them! 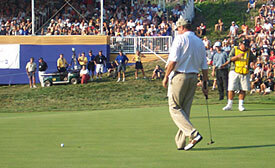 But as it was, Rollins deservedly smiled the smile of the unexpected winner, joined the ranks of the PGA greats, and made a bit of history at the 2002 Bell Canadian Open at Angus Glen Golf Club.